Recruiters often have to sift through tons of applications and lose time they could be spending on more important tasks. Jobpal designed a chatbot that helps both, the candidates and recruiters save time and money during the recruitment process. Jobpal developed a chatbot for recruiting. It automates parts of the hiring processes. The chatbot answers FAQs, schedules interviews and more. Looking for a job can often be discouraging and lengthy process, requiring candidates to spent hours tailoring their cover letters for each job application. Another time, the candidates are not quite sure yet whether to apply, but already might have some questions. Jobpal is a Berlin-based company that developed an AI-powered chatbot designed to speed up the recruitment process as a whole. People of all levels of interests can start interacting with the company chatbot and create a relationship even before applying. Plus, the chatbot is available every day, 24/7. Jobpal Brings A Win-Win Solution for Recruiting Processes? The recruiting chatbot automates parts or sometimes all of the hiring processes for companies. It uses Natural Language Processing to make it sound more human-like and currently works in 7 languages. What’s more, it can be fully catered to the company’s target audience. It is designed to answer FAQs, but if a question is too complex for the bot to answer, it will pass it onto a recruiter. In addition to scheduling interviews, Jobpal makes it easier for recruiters to quickly scan the applications and validate candidates more efficiently. Applicants can comfortably apply from any device and stay engaged thanks to the automated assistance. It is available on all devices without having to sign-up. Plus, Jobpal works on the most popular platforms including Whatsapp, Messenger, Slack and more. Too many favorable applicants but not enough vacancies? The chatbot builds a talent pool of candidates which might be a good fit for the future. Additionally, Jobpal provides clients with statistics and information about vacancies to speed up the whole process. Finally, the chatbot’s work doesn’t end with a successful hire. It supports new employees during their onboarding process, providing them with helpful information as well as gathers feedback to see how they are doing. 2016 April, Facebook opened a messenger platform for chatbots and everyone talked about the revolution in customers service and marketing. Jobpal, however, immediately saw a potential in the recruiting sector. 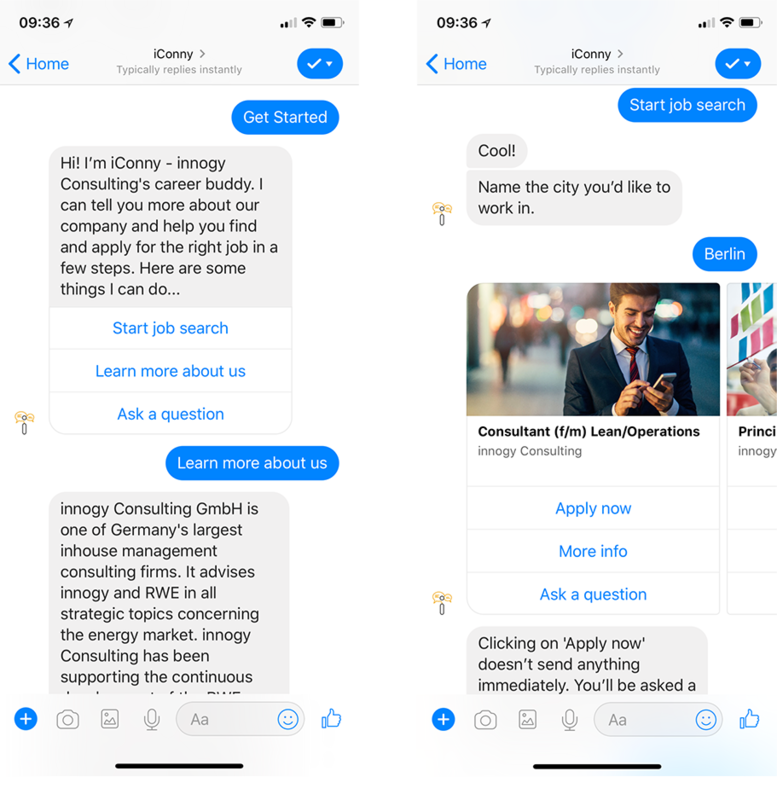 That’s why they designed a chatbot which could potentially reduce the cost per hire while doing the routine tasks at the starting phase of the recruitment process for you. The Jobpal team consist of 20 talented employees and acquired about 50 corporate clients including Deutsche Telekom. Next articleFoodly – The Revolution in Online Grocery Shopping?